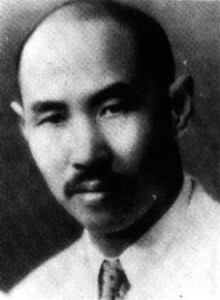 In the early 1940’s Wang Xiang Zhai was interviewed several times by reporters from Beijing newspapers. Those interviews have been collected and reproduced in various books on Xing Yi Quan and Da Cheng Quan under the title Essence of Boxing Science. Mr. Wang Xiang Zhai is the founder of Da Cheng Quan. He is well known and held in high esteem in Wushu circles in China. Recently he moved to Beijing. He has arranged a meeting time every Sunday afternoon from 1- 6 pm in Dayangyibin Alley for practitioners of different martial arts to exchange knowledge and opinions in order to carry forward and promote the martial spirit of China. Yesterday our correspondent called on him and together they had the following discussion. Correspondent: I have always admired you for your superb skills of boxing. May I ask what your ambition is with regard to the boxing art? Wang Xiang Zhai: I am indeed embarrassed when I am recommended by my friends as the representative of Da Cheng Chuan. I left my teacher in the year of Guang Xu Reign (1875-1908), Qing Dynasty, and since then I have traveled extensively in the vast areas north and south of the Yangtse River and have met with many great boxing experts of various schools and experienced untold hardships. My greatest gain in the past 30 years and more is that I have had many famous teachers and helpful friends, with whom I have held a lot of discussions, through which I have greatly improved myself. Therefore I count myself as a veteran boxer who has some knowledge of the boxing art. Of late, friends have given considerable publicity in newspapers to me and Da Cheng Chuan. In order not to be misunderstood by personalities of various circles who do not know the facts, I would like to make clear what I have thought in mind. I am now old and infirm without the slightest idea of seeking personal fame or gain. What I am anxious to do is to work in joint effort with my compatriots to carry forward the instinctive martial morality before I am too old to do anything, and to eradicate those heresies which harm others as well as myself. It is the last thing I would do to make others lavish praise on me and to win fame by cheating the public. Correspondent: What is the basis of the art of Boxing? Wang: What are the basic principles of the art of boxing? To this question, different people have different answers. Many people are fascinated to learn boxing routines, pay attention to patterns of movements, and to practice hits and beats. This, superficial as it may be, has been has been the popular concept of boxing for many years and has led many people astray. Correspondent: It is said that Xing Yi, Ba Gua, Tai Ji, and Tong Bei are of the inner family boxing (Nei Jia Quan), but I am not clear about their branches and schools. Wang: It is a prevailing idea that Xing Yi, Ba Gua, Tai Ji and Tong Bei are of Nei Jia Quan, but I am sorry to say that I don’t know how the names of the inner and outer families came about. So no comment can be made on this point. But by analyzing the master-hands of several generations one can see part of the picture. Xing Yi Quan of the Orthodox school Xin Yi Ba (Heart-Directed-Movements) and Liu He Bu (Six-Direction-Steps) of Hunan province are of the same origin. When tracing the origin of Mr. Li Dai-dong (known as “Old Dai”) of Henan, you will see that he is the great–grandson of Mr. Li Zhi He, who was the teacher of Elder Dai Long Bang. The Yuans of Jiyuan named the boxing differently, but it is in fact the same school with Mr. Li as its founder. By changing Xin-Yi (Heart-Intention) into Xing Yi (Form-Intention), Mr. Dai did not betray the original meaning of Xin Yi, because boxing originated from Liu Fa (Six-Ways). Thus a connotation of the phrase quan quan fu ying, meaning “to adhere to someone or something most faithfully” was applied to this form of boxing. It must be noted that Xing Yi Quan in its orthodox form had no such thing as the Twelve Forms (Twelve Animals), though their should be twelve forms of the body. Nor did it have the theory of mutual promotion and restraint of the five elements. The Five Elements are only five terms representing five forms of force, not methods or routines of shadow boxing. I still remember instructions taught by my late masters about the five elements: metal, wood, water, fire and earth. ‘Metal’ refers to strength in the bones and muscles which are hard as diamond and can sever gold or iron. “Wood” refers to the force whose range of action is compared to the supporting shape of a tree. “Water” refers to the force which is like a surging ocean and a dragon swimming in the sea, penetrating everywhere. “Fire” refers to the force which, like gunpowder, explodes and burns with a mere touch of the hand. “Earth” refers to the solid, heavy composite force which seems to have been produced by the joint action of heaven and earth. This is what is called five elements combining into one, not the stuff of one form of boxing overcoming another form of boxing as some people are preaching these days. If one observes first and then thinks twice in actual fighting, it is almost certain he will be defeated long before he takes action at all. Ba Gua Zhang (Eight Diagram Palm) was formerly known as “Chuan Zhang” (Palm of Sichuan Province). I once had an interview with Mr. Cheng Ting Hua. When he was performing art, he was, I recall, like a divine dragon roaming, winding and twisting in the sky. Such superb skills are really beyond the reach of us contemporaries. As to Master Dong Hai Chuan’s boxing, it is even more difficult to have a true understanding of his skills. Mr. Liu Feng Chun is a friend of mine. He has acquired remarkable skills, though his attainments are not so great as master Dong. Yet even then he is far superior to the practitioners of the “64 Palms” or “72 Kicks.” I hope that those who practice Ba Gua should concentrate on the single and double Chuan Zhang, try their best to perceive every movement. At the same time, they should make a penetrating study of the theory and put it into practice. Among the disciples by direct line of Tai Ji Quan, I think the most outstanding master-hands are the Yang brothers, Yang Shao Hou and Yang Chen Fu. As an intimate friend of theirs, I know there is indeed some genuine knowledge of mechanics in Tai Ji Quan. However, out of one hundred practitioners, less than one knows its essence. Even if one may happen to know some of it, he cannot have a thorough understanding of the whole, because the basic way of perceiving the skill has long been lost, and therefore there is no mechanism of force to speak of in its legwork and footwork. The boxing in question in its original form had only three movements and was thus called Lao San Dao (Old Three Cuts). It was changed by Mr. Wang Zong Yue and increased to 13 forms, which was further abused to as many as 150 forms. That is one of the main reasons why this boxing has lost its quintessence. If it is practiced for the purpose of preserving one’s health, it will only restrain one’s spirit and energy and bring discomfort to the practitioner. If practiced for actual combat, it will only do harm to the limbs. Its other functions, if any, are nothing more than idling away the practitioner’s time and confusing his mind. As to its method of practicing, which is characterized by disorderly blows of the fist and the palm or kicks of the foot and leg, I must say it is really ridiculous. In confrontation with a master-hand, such a practitioner of Tai Ji Quan is sure to fail. Even its master-hand I am afraid, can do nothing with a quite commonplace adversary so long as the latter is not very clumsy. In short, this boxing has been abused to such an extent that it might one day become a mere rigid form like a chess manual. In the last twenty years, most of its practitioners are not aware of its falseness. Even if someone is clear-headed he does not know what he should actually do. As to ordinary students, most of them believe in what they have heard without using their own eyes. Thus Tai Ji Quan is in fact being pushed towards its graveyard. What a great loss! I sincerely hope that those competent followers of that boxing will straighten it out and make it systematic with a view to developing it in the future. Here I take liberty to make comments on Tai Ji Quan, and I don’t know whether my comments are appropriate. Pardon me if I am too outspoken. I think that one day those learners of Tai Ji Quan who have really gained something would agree with me in this regard. Tong Bei Quan is very popular in North China, especially in areas around Beijing. But to my mind, most of the Tong Bei Quan practitioners I have met are not quite mature. There are some who seem to have got the essence of the theory, but their skills are far from being perfect. This may be due to the fact that they have not got the true teachings from their predecessors, who, I am sure, were certainly not like that. Some of the present practitioners of Tong Bei Quan are very skillful in certain movements, but taking as a whole they can hardly get on the right path. Mei Hua Quan (Plum Blossom Boxing) or Wu Shi Zhang (Five Form Pile Exercises), has been passed down generation by generation. Its descendants in the direct line can be found in Henan and Sichuan provinces. This form of boxing is quite the same in essence as Wu Ji San Shou (Five Free Hand Skills) practiced in Xinhua, Qianzhou of Fujian province and Santou in Guangdong province. When applied to actual combat, it has its own unique merits, but it is one-sided and not very practical. Ba Fan, Mian Zhang, Pi Gua, Ba Ji, Da Gong Li, San Huang Pao, Nian Tui, Lian Quan, etc. all have their own merits and demerits, most of them are superfluous in firmness but inadequate in suppleness and lack of inward spiritual strength. As for Da Hong Quan and Xiao Hong Quan, Tan Tui, Chuan Jiao, Long Boxing and Short Boxing, and various other schools, I will not make any comments here. Correspondent: What is your opinion on preserving the national art of boxing? Wang: It is really a pity that the boxing art of our country is now in a state of chaos, which can be summed up in one sentence: It has rejected the essence but assimilated the dross. Boxing arts from Japan and West Europe, though unique in some respects, are not based on the strength of the whole body. As mentioned above, Chinese Boxing is now in a chaotic state, and so it has to be straightened out and systematized with a view to carrying it forward. Who would take up this responsibility except us? This is why I, in spite of my shallowness, make such a forceful appeal to the general public.